The City of Rehoboth Beach is a resort community in the State of Delaware on the Atlantic Ocean. There is a year-round population of approximately 1400 residents. However, from Memorial Day through Labor Day, the daily population increases to 35-40,000 tourists and vacationers, and often reaches 80,000 or more on peak holiday weekends. Obviously, this increase in population brings with it additional law enforcement problems and concerns. Our current authorized strength is 18 full-time sworn police officers. 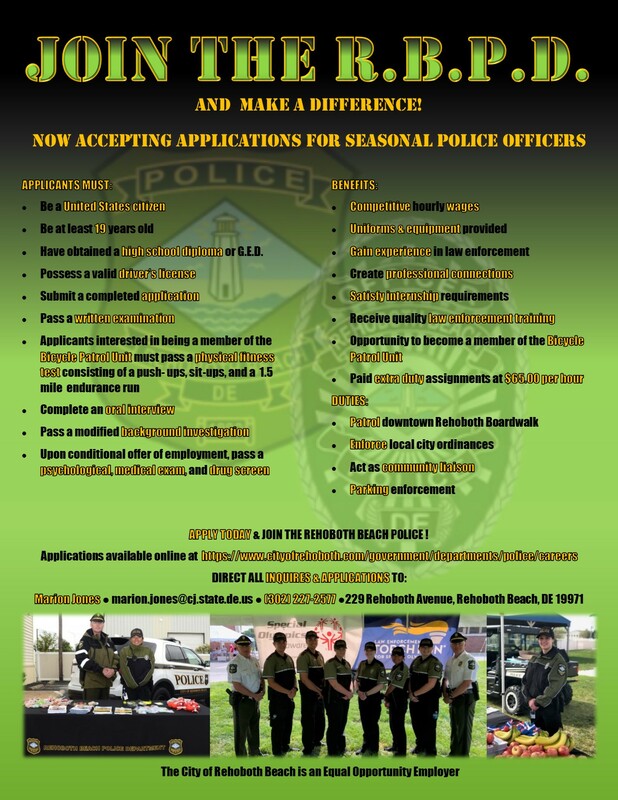 The Rehoboth Beach Police recruitment process for Police Officers and Seasonal Police Officers is a competitive endeavor and requires our agency to identify highly qualified applicants for employment consideration. Our community expects and deserves the employment of only those who possess the highest degree of judgment, maturity, integrity and credibility. 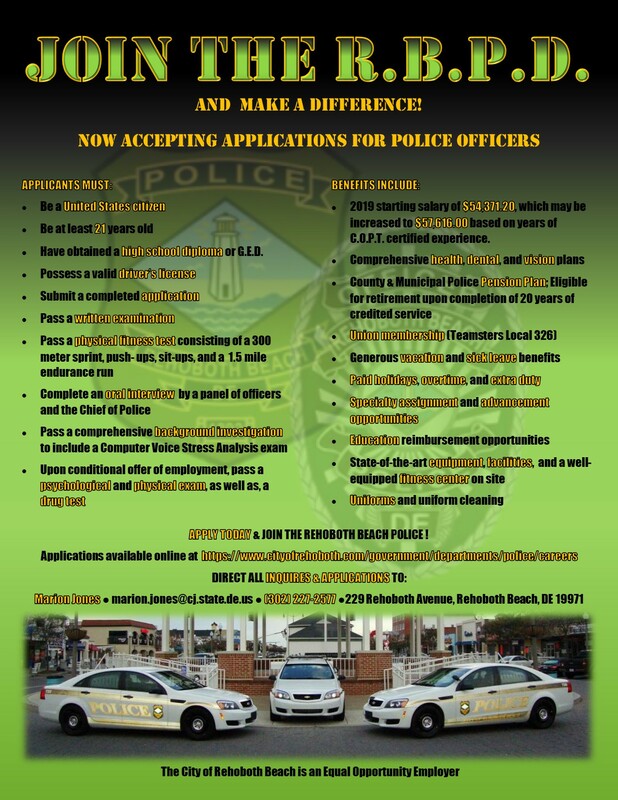 The Rehoboth Beach Police Department always accepts applications for the position of police officer. Although the department only conducts a hiring process when manpower needs dictate, you can submit your application to the office of the Chief of Police at any time, and it will be kept on file until its eligibility expires. Applications are eligible for the calendar year in which they are filed. Applicants who wish to remain eligible must submit an updated application each calendar year. The Rehoboth Beach Police Department always accepts applications for the position of seasonal police officer. The department conducts an annual hiring process for seasonal officers. The application deadline for the 2019 summer season is April 6th, 2019. Applications submitted after the deadline will be retained for the 2020 summer season. The Rehoboth Beach Police Department always accepts applications for the position of dispatcher. Although the department only conducts a hiring process when manpower needs dictate, you can submit your application to the office of the Communications Supervisor at any time, and it will be kept on file until its eligibility expires. Applications are eligible for the calendar year in which they are filed. Applicants who wish to remain eligible must submit an updated application each calendar year.